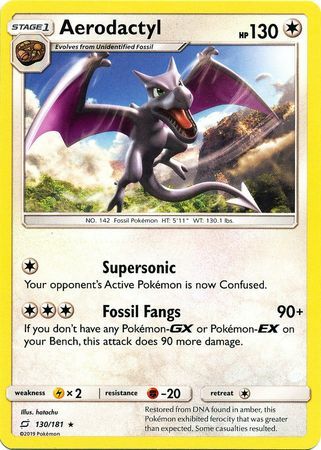 Aerodactyl is poised to do well in the new meta. You’re two shotting Tag Teams at worst, and it will OHKO pretty much every single prize Pokemon out there. I’m adding Mimikyu and Lunala Prism as a couple of supporting attackers because you’ll have four Aerodactyl at most, and sometimes you’ll need a fifth (or maybe sixth) attacker. Lunala Prism and Mimikyu might even do more damage in some cases than Aerodactyl too. But let me know what you think. I know I don’t have any Guzmas, and I was thinking about adding a couple of Batons or Dumbbells, but I just can’t squeeze them in. Decklists are SO tight right now, but I want to keep twelve supporters since I don’t have any built in draw support. So please let me know if you see something I’m missing! I think Aerodactyl can evolve from Ditto, so maybe one of those. Oh yeah great suggestion. Probably just drop one of the maps for it. Really good idea that’s worth a TUP code card send me your IGN and make something common tradeable. Thanks James.